For a complete set of features download the System Brochure or to schedule a demo or request information please call 315.635.1695 x111. Web-based software that provides SROs a user-friendly way to record incidents, conduct pattern analyses, establish appropriate and effective responses, assess the impact of their activities, and develop reports. Cross-platform web application that works on all major browsers and across multiple devices including desktops, laptops, tablets and smartphones. Access your critical information from anyway! 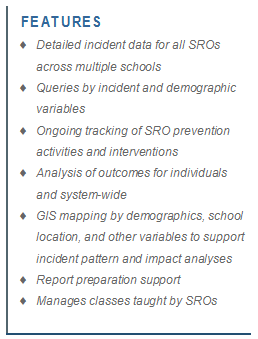 The SRO Incident Tracking and Analysis System is a user-friendly, secure, and reliable application developed to support the ability of School Resource Officers to easily record basic information about their daily activities and to improve their capacity to prevent and control problematic behaviors at schools. The primary emphasis of the SRO Incident Tracking and Analysis System is to facilitate accurate record keeping, using a wide range of demographic and school-specific variables. With these data, SROs have the information they will need to assess patterns of proscribed behavior, develop effective prevention strategies, and, wherever necessary, direct interventions to ensure the safety and order at their schools. The SRO Database is designed to allow SROs to establish and modify a full range of supportive programming, including the tracking of law-related education activities. The Incident Tracking and Analysis System also facilitates the development of reports to assist SROs in scanning for school trends by demographic, incident type, and geographic variables. To support trend analysis, the SRO Incident Tracking and Analysis System provides GIS Mapping capacity across multiple types of data points. The SRO Incident Tracking and Analysis System is a cost-effective and secure information management system in support of community policing activities. Each officer is able to keep track of specific interventions and incidents on a systematic, daily basis and to engage in systematic screening for problem areas and behaviors, analysis of patterns, the development of appropriate responses, and an assessment of the impacts of intervention, all hallmarks of effective community policing. This system is accessible by police administrators, who are able to track officers’ activities and the effects of their work. Senior school officials for each school and the central office may be granted selective access to the data so that they are able to monitor the activities of the SROs, a critical function in this era of heightened school accountability and joint school-police department funding of SRO programs. In the SRO Incident Tracking and Analysis System, each officer records a wide range of information about specific interventions and incidents on a systematic and ongoing basis. One or more individuals can be identified as instigators, targets, or both for a particular misbehavior or incident. The application allows the SRO to associate multiple individuals per incident in any target/instigator combination.